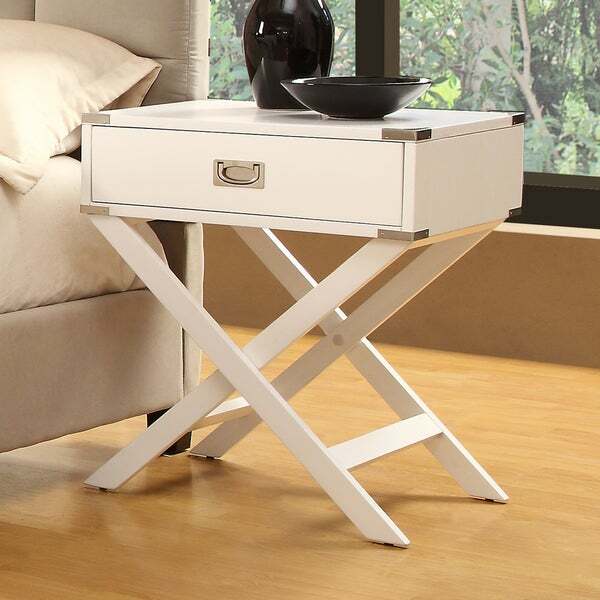 This Neo accent table features a fixed X-base, bright nickel brackets and French dovetailed drawers. This elegant bedside table looks fantastic in any modern setting. This trendy accent table complements other modern furnishings in your home. Because the table stands 27 inches high, the piece is an ideal place to keep a coffee mug or favorite book within your reach. Stash essentials in the drawer to keep them out of sight but easy to find. Although this product looks great in the picture, please do not be fooled. The table is larger than expected, so please keep this in mind. It is heavy and appears to be well constructed at first inspection. Once put together though, the legs do not sit level on the floor. I had my table on hardwood floor, and it rocks from side to side. The drawer does not pull out smoothly. Also one of the edges, where the decorative hardware is was busted in a little. Overall the table has a cheap look, as if only a single paint of coat. It probably won't last long. I regret purchasing this product and was very disappointed. On the the plus side, OS customer service did acknowledge my disappointment with the product. We purchased 2 of these. After a long shipping lead time, we received them only to find both units had manufacturing flaws. The hardware was installed incorrectly, leaving gaps around the handles, and the paint was missing in spots. This wasn't an issue from shipping, it was from the original manufacturer. Overstock was quick to ship 2 replacements. Both additional units were also significantly flawed. After calling again, we were going to shoot for another 2, however decided to move to a different product. Be very weary, but know that Overstock handled the issue VERY well.... but this manufacturer is junk. I am SHOCKED to see the 2 other reviews on this product be good. These were VERY flawed, and nothing (even at this pricepoint) I'd want in my home. I use these accent tables as night stands for my platform bed. They are perfect. They are sturdy and heavy. They were a breeze to put together. The drawer pulls easily. No issues at all and they look great. Perfect bedside tables. Love the larger size and drawer. Great style, very good quality, not flimsy.. So easy just the legs need assembling. I use this accent table as a night stand and it functions perfect in my beachy Miami home. I had been looking for bedside tables for quite some time. When I came across these I just knew they would be perfect for our master bedroom and believe me they don't disappoint. The only thing bad I can say is that the drawers could slide a little easier, but other than that I am very pleased with the quality, style and design. I also, purchased the TRIBECCA HOME Silver Mist 3-light Crystal Chrome Table Lamp, and they are the perfect compliment to the tables! Very easy to assemble, and looks very nice. One thing I will say, though, is that this nightstand was a bit more "white" than I imagined. It is a bright, pure white, not an off-white or slightly creamy, like it looks in the picture (at least it did look that way to me). Easy to put together, very roomy drawer, nicely spacious top, easy to clean, looks crisp and casual. For some bedroom spaces this would be a bit too wide for a nightstand, but it is quite versatile. I read previous reviews about this product being cheap, too big, and overall being a bad product. When I received it I was actually quite impressed. The quality is actually fantastic. The finish is a nice matte wooden feel. Size wise it's a tiny bit wider than most side tables but nothing humungous. For the price I picked it up (***) I'm extremely satisfied. Any other modern side table is easily above ***. Very easy to put together and a truly elegant product. I purchased 2 for our guest bedroom but this can easily be used in a living room or family room. Beautiful and elegant! I bought two of these chairs, and they were delivered to me last night. They were very well packaged, no pieces were damaged in transit. There was a teeny tiny imperfection on one of the drawers, but it's not too noticeable that I felt like getting a replacement. The quality seems great to me. 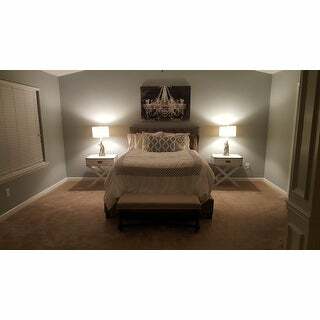 They went into an extra bedroom so they will not get a lot of wear and tear. Very substantial table space for what I need. Don't hesitate to get these! Perfect bedside tables. Looking for matching dresser. I was looking for end tables to decorate our beach house and took a chance to order this item. I am so glad that I ordered this! I was little doubtful about the quality, but it is pretty sturdy and solid. I was going to use for kids bedroom end table, but end up using in the living room. I also ordered 2 dark brown ones and they are good too. Very easy assembly (just legs need to be assembled). I am ordering 2 more for kids' bedroom! This is a very stylish table, so easy to assemble and they even provide the wrench to tighten screws. It looks so nice next to the bed in our guest room. I really liked the size. It is taller and wider than most nightstands. Looks nice but quality is not the best. Great end table. Really cute! Love, love LOVE these night stands! The drawer is a good size. They're well made and are the perfect accent piece to my master bedroom. Durable and beautiful! My favorite piece in my bedroom. Rather cheaply made but should be expected for price. Needed bedside tables but didn’t want to spend a ton of money. These have a stylish look and are sturdy and sizable. One issue is that drawers seem to stick miserably no matter what I do. "what dresser would compliment this nightstand? i love it but im finding a hard time with a dresser option"
Hello jax, although we do not have a specific dresser to match, we do offer an array of styles which should complement this table. Please see the following link to view dressers with a white finish from our inventory (http://www.overstock.com/Home-Garden/Dressers/White-Finish,/finish,/2017/subcat.html). Thanks for shopping with us! The accent tables are pretty, looked sturdy but not bulky and I love the X base & color. I needed a night stand and this one is displayed with the same platform bed that I have. It looks very good together. "My drawer in the night stand was cracked when I received it and I was sent a new drawer but we can not figure out how to remove the old drawer to insert the new one." Hello bjcrawshaw, We will have a customer specialist contact you with further assistance. Thanks for shopping with us! If you look underneath, you will see the shelf has a little clear rubber thing, that stops the drawer from sliding out. It looks like it has screws, so you can unscrew it with a screwdriver. "I love the look of these, but I'm very concerned about them being wobbly. Not that I plan on putting anything too heavy on these, but what is the weight limit? As for the drawer, does it have a nice smooth track to move on?" Hello james011, The reviews are a good source of feedback on the quality of an item, this has 4.2 out of 5 stars for 15 reviews. Assembly is the key to the stability of a item. The drawers have wooden glides. We do not have a weight capacity as this is a night stand and not weight tested. Thank you for your questions. I just bought these, and I find them to be sturdy enough for me. I have a lamp, and a few things on top of it, and it is fine. However, I wouldn't put anything REALLY heavy on top. As far as the drawer, it doesn't have the metal glides (like a kitchen cabinet/drawer), but we have no issues with opening and closing the drawers. "Is this white or off white? It looks a creamy color in the picture"
Thank you for your inquiry. Unfortunately this item is out of stock. We currently do not have inventory to check, and cannot guarantee the item will be restocked. "HOW MUCH DOES THIS TABLE WEIGHT???" The item ships at 38 pounds. "Does this come in brown?"